Radios operating in the VHF and UHF bands require a license which is available from the Irish communications regulator, Comreg or the UK regulator, OFCOM. There are RF power limits imposed by the EU on all frequencies. This is to prevent interference with the emergency services. You should choose the appropriate radio based on the application and where the radios are going to be used. Check the frequency and the RF power output of the radios to see whether a license is required. Note that VHF and UHF radios require a license but will send data over far greater ranges, 20-80km (max power output up to 35 Watts) compared to 868-870Mhz radio modems license free with a maximum power output of 500mW and having a transmission distance of 10Km, and 2.4gHZ license free radios which will send data up to 5-6km (max power output of 100 mWatts). Note that the channel must be clear and the radios in line of sight when applying this rule of thumb. If you are unsure if a radio modem will work in your application do a site survey and test the radios in-situ. If testing for longer periods on VHF and UHF bands you may use a test license which are also available through the regulators. For Irish customers please visit the website Test and Trial where you can apply for a license for up to one year. The test and trial license is designed to help manufacturers research and develop new products and services in Ireland. 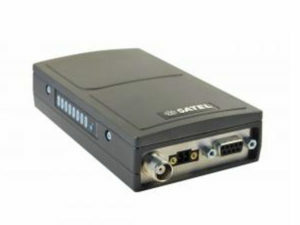 We supply both Satel and Maxstream wireless radio modems. They are very robust, reliable & long life and cater for all VHF, UHF and 2.4GHZ licensed and license free frequency bands. We will recommend a product to you based on the type of application, distance being covered, location and regulatory and security requirements. We will also arrange a site survey if you require same. Please contact or email us for more details.